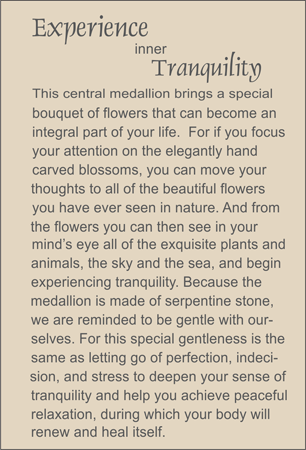 Tranquility is the sentiment express by this flowering plant medallion which has been hand carved from carnelian stone, for it is by turning by nature that we can best find peace and tranquility. This medallions is suspended from a necklace of simple cut carnelian, in which black onyx waveforms have been inset to remind us that we replenish our own energy through this state of tranquility. Sterling silver toggle clasp.